It all began with a Woman’s love and dedication for Exotic Cats. In the beginning, before there was an In-Sync Exotics, there was Vicky Keahey, a hard-working veterinary technician. She spent her days caring for, comforting and playing with the array of animals who visited the clinic where she worked. 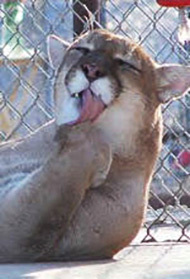 Then on one fateful day in 1991, a female cougar was brought into the clinic for treatment. The cougar, named Tahoe, accepted her vet’s help graciously. But when it was time for Tahoe to return home, she was kept waiting and waiting until, finally, it became apparent that she had been abandoned. By this time, Vicky had grown attached to the 18-month-old cougar. Since the young cougar now needed a new home, Vicky happily obliged. So with Tahoe, Vicky got her first experience in rescuing and caring for an exotic cat. Because exotic cats aren’t like average house cats, Vicky had a lot to learn about the specific needs of cougars. 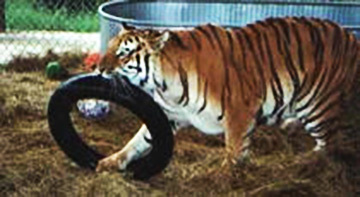 Vicky turned to her vet and the Texas Parks and Wildlife Department for help. Over time, Vicky and Tahoe built a bond of love and trust and learned to respect each other. Vicky had also earned the respect of the Texas Parks and Wildlife Department. In 1994, an officer brought Vicky a second cougar in need of help. 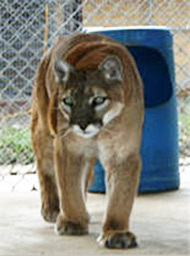 Vicky accepted the ailing male cougar, whom she named Ranger, and nursed him back to health. Tahoe also accepted the presence of Ranger, and the two soon became inseparable. Vicky was now the happy and well-entertained owner of two beautiful cougars. She learned more with each passing day about their personalities, likes and dislikes, and she spoiled them terribly with her love and attention. She also learned that private ownership of two large cats is an enormous responsibility. The cats required very expensive food, shelter and medical care and tremendous time commitments. Though Vicky was content with her two exotic charges, once again fate intervened. 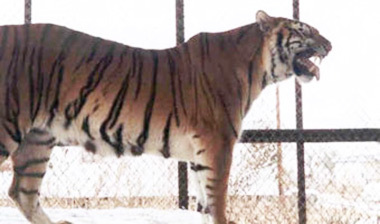 In June of 1998, Vicky met a 3-week-old female Bengal tiger that was badly maimed and inexcusably neglected, and her heartstrings were tugged to her very soul. The tiger’s breeders were considering their options. They couldn’t sell this tiger cub because she was in such bad shape, and they didn’t want to care for the cub because she needed too much care. The tiger’s life was clearly in danger. Vicky frantically searched for a way to rescue this cub knowing that if she took her in, it would be an even greater responsibility and time commitment than she already faced with the two cougars. Finding another home proved an almost impossible task, though. As the cub’s life became more eminently endangered, Vicky decided to rescue the cub herself. She named the little girl Kenya and lovingly nurtured and healed her wounds. Vicky’s experiences with Kenya and the bond the two shared led Vicky to the idea of establishing a non-profit organization dedicated to caring for rescued exotic felines and sharing her experiences with others. Believing that one person on a mission can make a difference and help better our world, Vicky researched how to establish a non-profit organization for her feline friends. She completed endless stacks of paperwork and obtained all related licenses. And thus in March of 2000, In-Sync Exotics Wildlife Rescue & Educational Center was born. With Kenya for inspiration, the organization’s name reflects the ideal of providing harmonious care for all exotic felines. We are In-Sync to the cats’ feelings and needs.